Visit N.A.T. at booth 6B40, hall 6 at Mobile World Congress 2019 (MWC19) in Barcelona, Spain (February 26th to 28th, 2019). 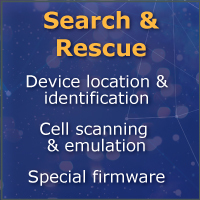 At 2019 Mobile World Congress in Barcelona, N.A.T., a leading supplier of communications solutions based on open standards, is presenting new solutions for 5G SDR, 5G Industrial Internet of Things (IIoT), search and rescue, private networks, mobile device identification, law enforcement and enhanced mobile communication architectures. NAT-AMC-ODSP-W: compact single board computer providing 2 or 4 independent RF-channels, GPS, DSP, FPGA and quad-core ARM based processing. 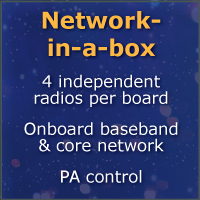 Utilizing the comprehensive range of available rich featured onboard software from our strategic partners Octasic and FXLynx and others, the board implements a customizable RF to Layer 3 functionality up to a complete eNB. NAT-AMC-SDR: compact single board Remote Radio Head (RRH). 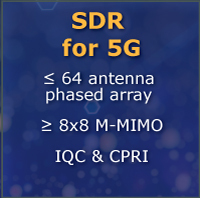 The 8x8 MMIMO capability of NAT-AMC-SDR together with a fully customizable onboard FPGA enables customers to develop and test new algorithms and waveforms for lab use or rapid prototype deployment. NAT-AMC-SDR-LO: support board for NAT-AMC-SDR systems. Enables an SDR solution with 64 phase-synchronized channels for phased array applications. NAT-AMC-ZYNQ-FMC: modular FPGA board with exchangeable RF front end. Supports UHD-driver and thus can run a variety of SDR software applications such as GNU Radio, Amarisoft, and OpenAirInterface. Being setup as an eNB-IoT in this demonstration, the NAMC-ODSP-W NAT-AMC-ODSP-W and the NAMC-ZYNQ-FMC targets at Industrial Internet of Things (IIoT) appliances. Together with two major German vendors in process and device automation N.A.T. 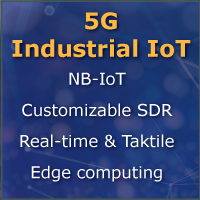 and its associated partners are researching how Narrow-Band-IIoT (NB-IIoT) can be used to build a tactile radio environment meeting the real-time requirements of industrial automation. A prototype which is based on COTS products in industrial open standard form factor MicroTCA (MTCA) utilizing a 1U 19” rack mount system (NATIVE-C1), and Intel ® single board computer and two NAT-AMC-ODSP-W provides a full M2M/IIoT network-in-a-box for both cellular access points and data terminals, meeting the IIoT requirements for real-time, robustness and throughput. In this demonstration the NAMC-ODSP-W operates in a special eNB mode targeting at applications requiring mobile device identifications, i.e. public safety or Law Enforcement appliances. Based on a 2 or 4 slot open standard infrastructure (NATIVE-mini), the NAT-AMC-ODSP-W provides typically required functionality as 2G/3G/4G cell scanning and mobile device identification. Furthermore, features like Call Connectivity Control, IMSI Catcher and Silent Call and Message can be demonstrated to proof the capabilities of the NAT-AMC-ODSP-W for Perimeter protection and law enforcement. In this showcase we demonstrate the NAMC-SDR as a COTS rapid prototype platform for 5G targeting at research and development appliances. Utilizing the onboard FPGA, the board can be operated stand alone or connected i.e. to MATLAB and Simulink environments, allowing the scalable 8x8 RF interfaces to be used for proof-of-concept e.g. for beam forming, PHY/MAC development, large antenna arrays etc. Our boards can be combined with other products from N.A.T. facilitating connectivity for E1/T1, E3/T3, OC3, OC12, OC48, ATM, 10GbE and LTE and with high-end multi-core network processors for signaling and deep packet inspection (DPI). All N.A.T. board level products can be deployed in a variety of custom vRAN and C-RAN operating environments, including N.A.T.’s own range of MicroTCA systems. This enables customers to start with minimal capital expenditure, while providing a fully deployable platform. Come and join N.A.T. at booth 6B40 in hall 6 presenting these unique communication solutions. Please schedule your communication slot in Barcelona with Heiko Koerte (Director of Sales and Marketing) or Terry Manus (Business Development Manager North America) by e-mail to Mrs. Bettina Bilogan (bettina.bilogan(at)nateurope.com). For a downloadable product overview please refer to our brochure “The N.A.T. MTCA Concept”. Please visit our wireless solution page for more information about our wireless products or watch our introductive video.